Every year since the Depression, the town of Paso Robles relives its heritage. The northern half of San Luis Obispo County (North County), California, is represented in this example of what I like to call real or pure Americana. Paso Robles itself is about 20 miles from the Pacific Ocean with the Coastal Range between the city and beach. It’s roughly halfway between Los Angeles and San Francisco. Mentioned this briefly last year, but “Pioneer Day” started at the beginning of the Depression when obviously most were struggling. The community geared up the day to celebrate what people did have back then and that was friendship. So they tied in the commemoration of the cities heritage with a community day and incorporating the theme “Leave Your Pocketbook at Home”. The town got together organizations, churches, businesses along with individuals and gave a little something back to the citizenry. So this big “thank you” to the town folk has occurred every year since. About mid-morning, a parade starts going around our city park, which is centered in the middle of town. This parade is a story unto itself. When I first saw this, it was almost surreal – giant steam-powered tractors which are the biggest stars of the show, come puffing down the street. I mean giant; like a couple stories tall. I can’t really describe it because it feels like you stepped back in time. Coming from not just North County but far beyond, these are museum pieces and you have to realize that these behemoths, a few with one-cylinder, yes one cylinder, are actually still running over 100 years after they first were built. It’s hard to believe these vehicles can run and some of them are absolutely beautiful. Every tractor you can imagine drives by along with lots of bands and of course the town’s officials and business people. Classic cars, steamrollers, harvesters and fire engines of different sorts also parade around and there are some cool horse-drawn vehicles and they too might have dignitaries on them. After the parade, the lines form for the bean feed – it’s free so you can imagine what it looks like when all of a sudden several thousands people stand in line in our city’s park. Then you can mill around downtown or go to the Museum (Pioneer Park) and look at some of the vehicles up close. There’s also a horseshoe throwing contest. Don’t forget, there are tasting rooms in every direction. There are all kinds of things to do like watch wood carvers, shelling and grinding corn, make butter, watch a smith shoe a horse and basket-making. There’s probably more but you get the picture. If you’re into antiques and friendly socializing the way it used to be, this event is perfect. It truly is everything that a small town or community can offer. The atmosphere is fun and special … pure Americana. 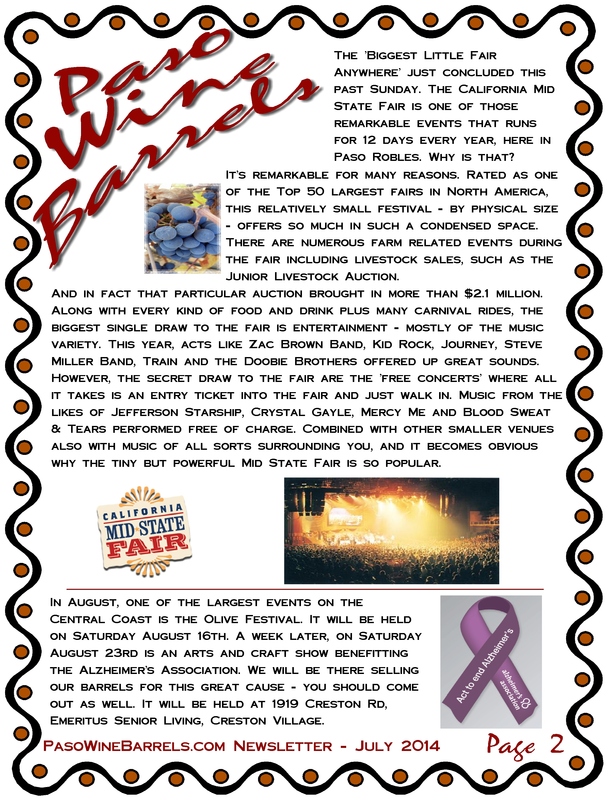 This entry was posted in Central Coast, Events and tagged Americana, North County, Paso Robles, Paso Robles Pioneer Day Is Pure Americana, Pioneer Day on September 30, 2014 by PasoDr. Everything and everybody has a month nowadays but certainly wine should have at least one month in California considering the growth of the industry here in the Golden State. September has been Wine Month in California for 10 years now and here are some reasons to celebrate aged and fermented grape juice. Indeed this time of year is the most active along with being the most important season when it comes to wineries. This is harvest season and vineyard and facilities don’t have a busier time than the picking, destemming, crushing, pressing, fermentation and finally storage period of the year. This is immediately followed by harvest festivals and dinners. It’s a great time of year for customers or fans of wines to meet the winemakers while having a little fun either helping with harvest and wine processes or enjoying the beautiful view of a vineyard with vines full and lush. The saying goes: ‘Come for the view, Stay for the wine‘. Often wineries will have special events including concerts and of course, who can go to wine country without wine tasting. 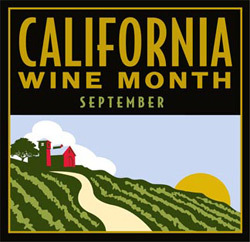 Commemorating the states huge investment in the wine industry with its own month is the perfect example of just how important vinification is in California. Producing upwards of 90% of the United States wine production is impressive in itself. As a major food supplier to the U.S., California also is one of the food destination regions in all the world. A signature example of that is the just concluded Savor The Central Coast in Santa Margarita. The event celebrates food and wine merging two activities that are a huge draw to the area. Paso Robles, on the California Central Coast, was named the world’s number one wine region. Like the Savor event with food, entertainment is becoming more and more the norm in wine country. For instance Crosby Stills and Nash are performing September 30th at the Vina Robles Amphitheater. The spectacular center is in its second season. As the number one agriculture in the state, viticulture brings in over $50 billion a year from nearly half a million acres. $3 billion in taxes are generated and the wine business has created well over 300,000 full-time California jobs (source: PRWCA). From the North Coast highlighting Napa and Sonoma, out to the Sierras, down through the Central Valley and across to the Central Coast and beyond, the array and variety of grapes and wines from California is unmatched in the world. If you missed it, you don’t have to only come here in September and in fact, once Harvest is done, as briefly mentioned before, festival and dinners, mostly in October, adorn hillsides after valleys after hillsides throughout the state. 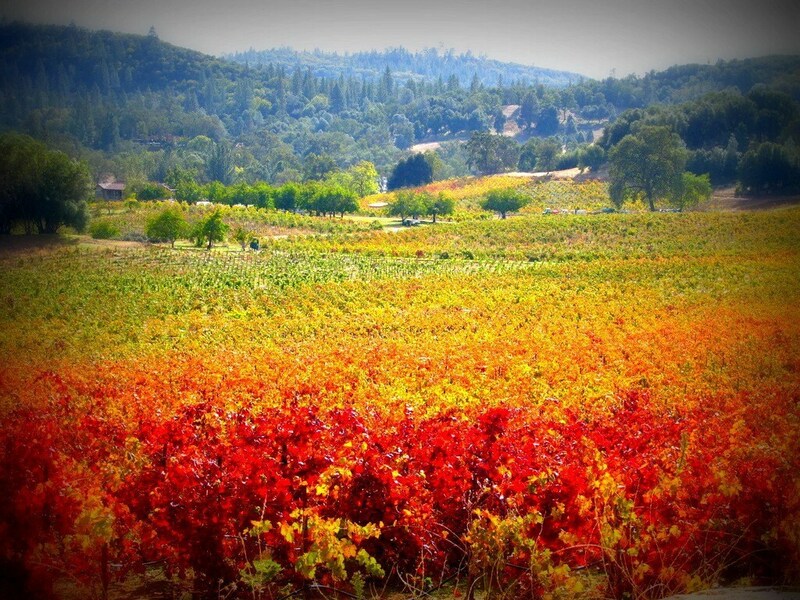 And the change of colors starts to appear in fall giving the countryside, in almost any wine region in the state, a golden glow, showing once again why California is such a special place … and surely offers another reason to call it the Golden State. This entry was posted in Wine and tagged California Central Coast, California Wine Month, food distination, Golden State, harvest, wine country, world's number one wine region on September 29, 2014 by PasoDr. The magic of wine and how it’s stored is obviously up for debate. Certainly when it comes to storing wine in a receptacle, there are multiple ways to do it, not the least of which is using oak wine barrels for aging. Even when not stored in wooden casks, oak chips or other forms of oak are introduced into the container to offer that unique taste and smell that give wine an inimitable and exquisite aroma. Once the wine leaves the winery and becomes part of the landscape of someone’s home or business, then the debate arises as to whether cork or screw caps should be used. We won’t argue the merits of boxed wine – I think you know how that discussion will end. This is a short and simple dialogue, plus I need to make clear I’m not a wine connoisseur, but my research into the world of wine and wine barrels has brought a lot of facts to the fore. Cork is the classic answer to any query about how wine bottles should be enclosed. 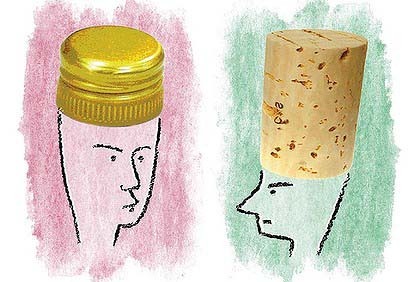 However, with wine becoming more and more popular and cork a limited resource, screw caps have made major inroads. Even amongst cork-style preservation covers, synthetics, rubber and other forms of non-cork products are being used. Still, we’re sticking to cork versus screw caps for this debate. Cork comes from the bark of a particular cork oak (quercus suber) and has been used as wine stopping material for roughly four centuries even though the Roman Empire first introduced cork as a stopper over a 1,000 years prior. Rags were often used before cork – yes, not very presentable. With limits, cork is a renewable resource and biodegradable. Being permeable though, has made corks imperfect with a slight bit of oxygen sometimes able to ooze into the wine. This means that a very small amount of corks can taint wine, although a few experts say sometimes a little breathing can be good for more full-bodied wines, allowing them to level out. Although maybe not scientific, there’s something symbiotic about wine coming from an oak barrel and being corked with oak. Screw caps were first prominent as a closure with ignominious jugs of wine a half century ago. However, the turn of this century saw newer winemakers using screw caps regularly as closures on better wines. Though not biodegradable, with advent of wines popularity growing at ever higher rates around the world and limits on corks availability, screw caps have become more and more the norm with wines. However, without the capacity to offer any redeeming qualities other than keeping a wine the same as it was when it entered the bottle, screw caps are simply a cheaper and easier application for wine bottles, especially those wines that should be consumed earlier rather than later. Of course, a supposed advantage of screw caps to cork is the fact wine doesn’t need to be stored on its side – corked bottles will dry out if not left on their sides. It should be noted that the manufacturers of screw caps have designed a product that will breathe. Screw caps are the norm down under and are now popping up all over the United States, while Europe has been slow to change. Screw caps are easier to open although yours truly has had to mangle a few caps that would not come off without a visegrips. Another more anomalous thought is: Does the formality of opening a bottle with a corkscrew matter? In the end, the screw cap is here to stay; it’s just the issue as to which and how many wineries will change over from the traditional and erstwhile cork to the modern and contemporary screw cap. There will likely be a place for both as some traditions die hard and modernity be damned. For my own personal opinion, the creaking shrill sound of a screw cap isn’t very remarkable. Plus, there’s something special about the ‘pop’ of opening a bottle of wine … don’t you think? This entry was posted in Wine and tagged cork, Cork Versus Screw Cap, screw cap, wine bottle on September 26, 2014 by PasoDr. Saving Wine With Coravin: Is It Worth It? I may or may not have mentioned it in prior stories, but there’s a wine stopping and preserving system that when used, can keep wine for up to a month … or longer. The stainless steel device is made by Coravin and cost a tidy $299. Is it worth it? Alright, here’s the part where I once again state that I’m not a wine expert and don’t plan on playing one anytime soon. However, since my business is of the wine barrel persuasion, I do pay attention to what is happening in the world of wines. Greg Lambrecht is the Coravin inventor and entrepreneur who came up with this contraption that has silenced many gadget-phobes who usually cringe at such New World contrivance. 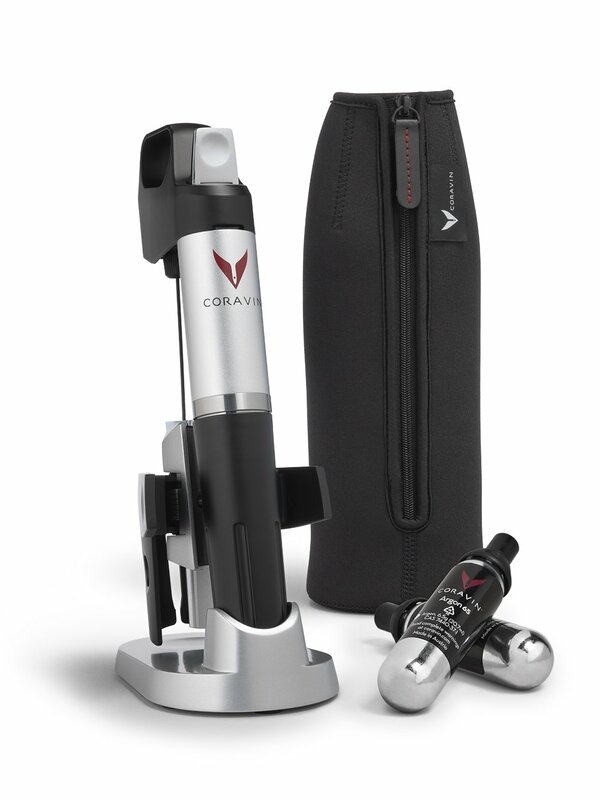 The Coravin 1000 Wine Access System came out last year and although priced for only those serious about wine, the market obviously includes businesses such as restaurants who are opening bottles of wine all the time and forced to lose part of a very good bottle of wine or sell a whole bottle when maybe the customer wants just a glass. Simply stated, the apparatus is set on top of a wine bottle and a surgical-style needle is plunged inside the cork and extracts the liquid while not allowing oxygen into the wine – the ultimate deathnell to any wine. The Coravin fills the empty space with Argon – an inert gas used to displace oxygen. Check out this quick 15 seconds demo here. By the way, the gas tubes last for several bottles of wine with the replacements running $10.95 each. Dating back to my classic car restoration days, I’m familiar with Argon which is commonly used used to weld. When I became involved in wine bottling, I learned it was shot into a bottle just before the wine was added, displacing some of the oxygen in the bottle. So the idea of this plunger adding argon into the bottle makes sense. Still, while the product initially swept everyone away, earlier this year, there was a recall due to the product exploding glass. Since then, they have added a protection sleeve to slip over the bottle prior to accessing the wine. And now, they also issue a warning. The question is, is it worth the $300? For any sommelier, this gadget is priceless. Now you’re able to open a great bottle of wine and close it right back up after one glass. It’s been argued what or how long is the length of time one can actually reuse a bottle of wine before the acidic and vinegar taste starts permeating the wine. Some have said the technology doesn’t allow a bottle of wine to last more than a few weeks while others say wines have kept their taste for several months. For wine connoisseurs and aficionados, Mr. Lambrecht’s piece of equipment will allow you to dabble through your cellar of wines without having to drink the entire bottle. Even if the wine does turn after weeks instead of months, just the fact that you could go a period of time after opening and still have the quality and taste of a just opened bottle, is likely worth the price of the unique device. As for the rest of us regular folks, we’re better off just drinking the whole bottle – hey, isn’t that what we do with ease anyway? 300 bucks is a lot of money, but if wine is what you are all about, then this Corazin appliance is a must have regardless of the price. And hey, the rest of you quit snickering about the fact that people don’t finish a bottle of wine right away after opening. Yea, you know who you are. This entry was posted in Wine and tagged Coravin, Coravin 1000 Wine Access System, Greg Lambrecht, Saving Wine With Coravin: Is It Worth It?, wine cork, wine stopper on September 25, 2014 by PasoDr. 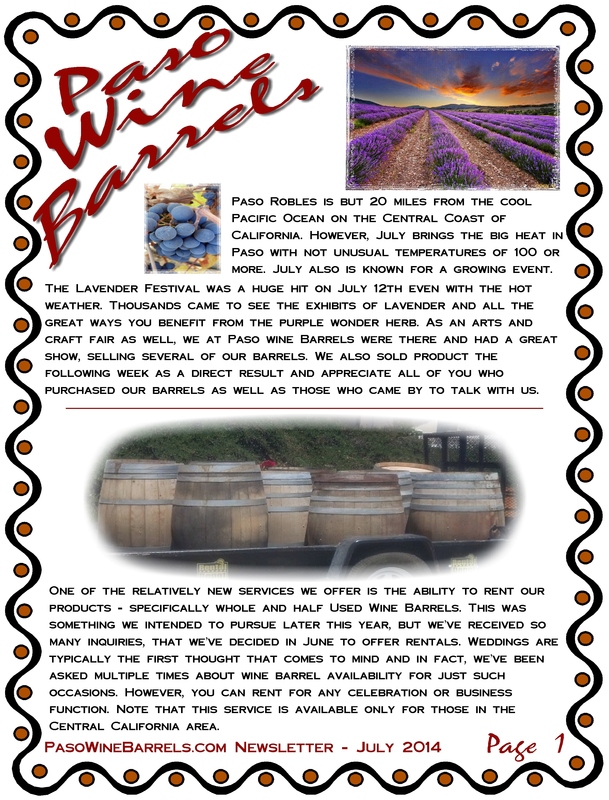 This entry was posted in Newsletter and tagged July Newsletter, Newsletter, PasoWineBarrels.com on September 24, 2014 by PasoDr. The relatively unknown and quaint little town of Cayucos has been around for almost a century and half. It’s 138 year old wooden pier is nearly as old but had been closed recently due in part to its age, lack of maintenance and storms. 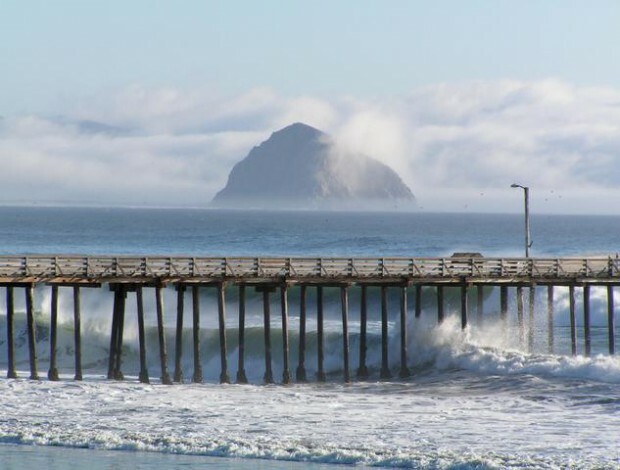 Although technically owned by the state of California, the County of San Luis Obispo operates the pier along with being responsible for repairs. It appears those repairs will be made. The County Board of Supervisors voted for approval to spend nearly $2 million to rebuild and repair the aging pier that is one of the oldest structures on the California Central Coast. Several hundreds of thousands of dollars had already been spent from different entities including donations, to keep the venerable pier from coming apart. Pilings are missing and structural braces are bent or broken under much of the revered pier. Due to safety concerns, the pier has been closed since last summer. And it should be noted that there’s over a quarter of a million donated dollars that will be used to keep up the repairs in the years to come. With less than 3,000 citizens, the sleepy small town of Cayucos is unincorporated and sits on the Pacific Ocean about halfway between Los Angeles and San Francisco. 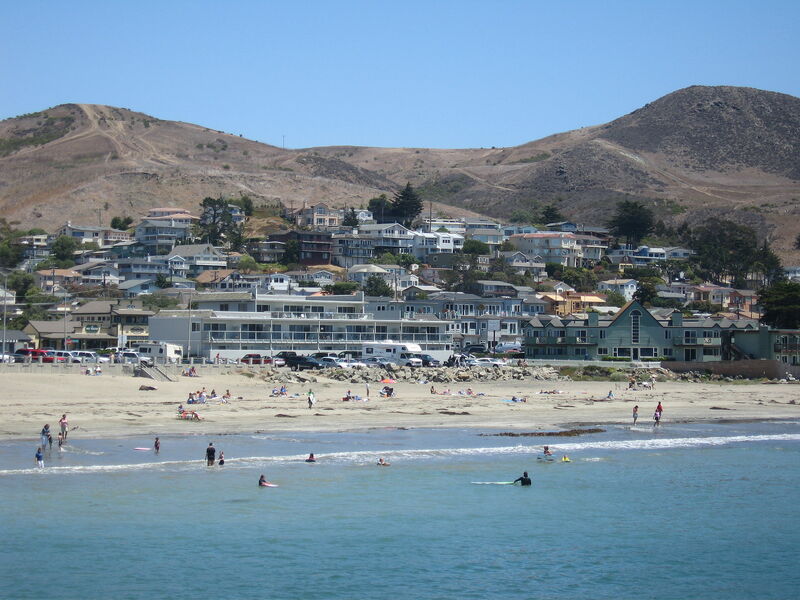 Located at the northern end of Estero Bay, the area is more of a south facing beach than west and therefore is typically warmer than their compadres to the south in Morro Bay – which is roughly 10 miles away. Including Morro Rock to the south, the views are stunning and lucky for them, Cayucos is one of the those beach towns that never grew up. To the east, Whale Rock Reservoir sits just above the town. The Cayucos Pier was built in 1876 by the cities founder, Captain James Cass, who was originally from New England (go here for more on Cass). Considered a shallow bottom pier, it’s now nearly a thousand feet long. Construction should begin next month with completion by May of 2015. The pier was repaired after major damage in the 1980’s and again a decade later. It’s thought some of the wood pilings could be over 130 years old – much of the pier will be demolished with new timber pilings added. This entry was posted in Central Coast, History and tagged California Central Coast, Captain James Cass, Cayucos, Cayucos Pier, Morro Rock on September 23, 2014 by PasoDr. Some comments pop up every once in awhile about how cork should be replaced with screw caps or some other receptacle topping container. The argument typically goes to the fact that cork (quercus suber) comes from trees and is not necessarily a renewable product. That would be wrong. The product that makes itself most popular as a wine stopper, comes from the bark of an evergreen oak tree called the cork oak. After the tree is established for a couple decades, the cork can be carefully stripped off the tree and then every decade or so afterwards. This entry was posted in Wine and tagged cork, cork oak, quercus suber, screw cap on September 17, 2014 by PasoDr.